The magnitude of DeltaTm associated with ligand binding depends on the thermodynamics of protein stability, particularly the enthalpy of protein unfolding. 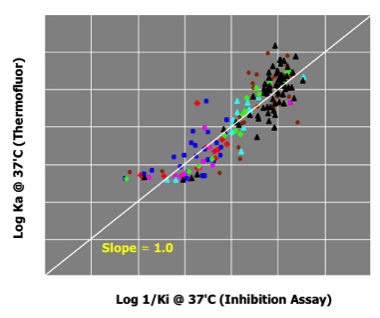 A protein's enthalpy of unfolding can be directly measured using DSC. Although the enthalpy of protein folding can differ for each individual protein, multiple ligands tested against the same protein will show DeltaTm effects that are proportional to Ka. For a detailed treatment, based on inhibitors of carbonic anhydrase, see references below.